The dollar has failed; the grid is wiped out. Walmarts are looted and homes are abandoned as common folk flee and bloodthirsty militias fight for power. In a twenty-first century America gone haywire, Darwinian struggle for survival is the law of the land. Van Dorn, eighteen and running solo, was raised by his father in the old ways: to value survival, self-reliance, and righteousness. Determined to seek justice, he fights through a litany of horrors to save those captured by Cotto, a savage, drug-crazed warlord who has risen among the roving gangs, gaining territory while enslaving women and children. As destinies collide and survival becomes an increasingly distant fantasy, battling ideals of right and wrong come to an explosive head. 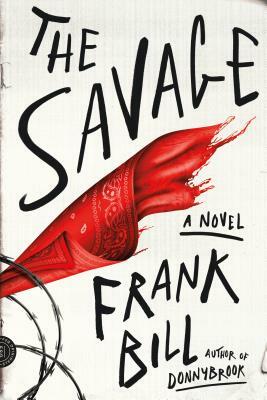 Chock-full of the razor-sharp prose and bloodlust that made Donnybrook impossible to put down, The Savage nonetheless finds Frank Bill raising the stakes. Here, one of America’s most iconoclastic young storytellers presents an unnerving vision of a fractured America gone terribly wrong, and a study of what happens when the last systems of morality and society collapse. Frank Bill is the author of the novel Donnybrook and the story collection Crimes in Southern Indiana, one of GQ's favorite books of 2011 and a Daily Beast best debut of 2011. He lives and writes in Southern Indiana.